Now that Easter is done and dusted, I can start my ANZAC baking with gusto! I tried my firstANZAC biscuit when I was 37 years old and came to live in Australia. Don’t worry though, I have certainly made up (or rather eaten up,) for lost time. I have fully embraced all thingsANZAC with slices to muffins and pretty much everything in between. 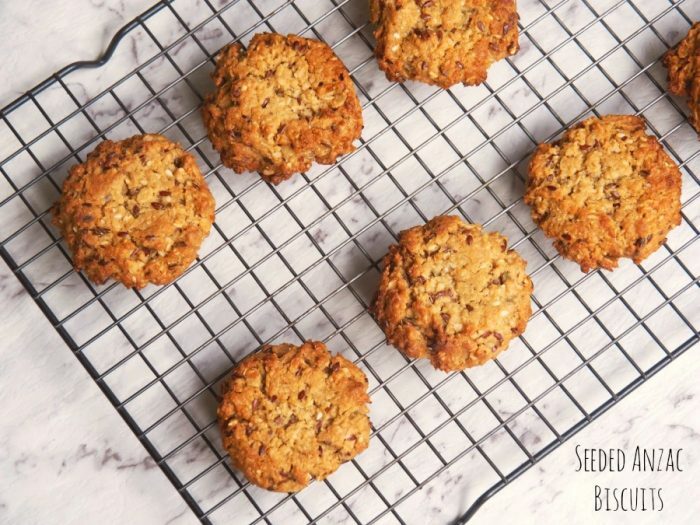 I think the ANZAC ingredient combo of syrup, brown sugar and oats is pretty much the biscuit trifecta but there’s always room to improve, even on perfection! 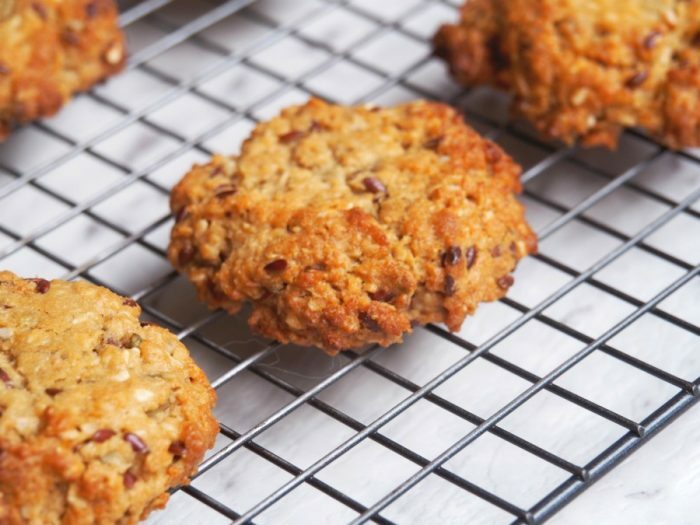 These little biscuits are pimped up with some seeds, which surely makes these biscuits basically a health food. I slightly adapted this from Nigella’s recipe and also added a Thermomix conversion because these days I am both too lazy and too messy to bake without it! 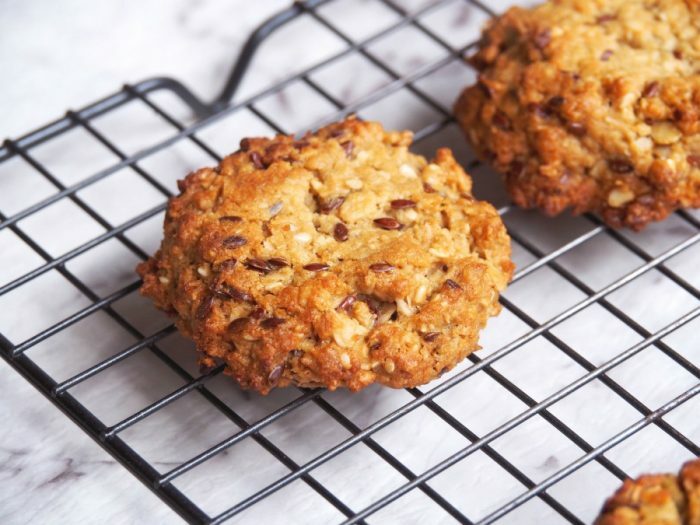 I used sesame seeds and flaxseeds because that’s what I had to hand, but this recipe is very forgiving and you can swap any seeds in or out, to suit your taste. 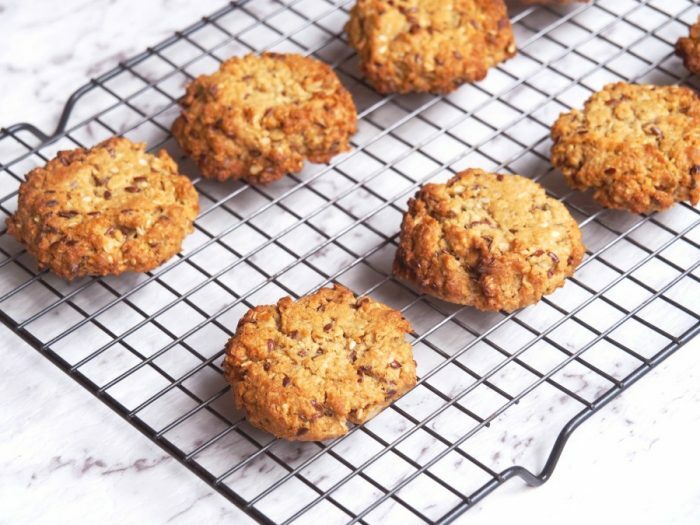 I don’t know about you, but I love my ANZAC biscuits soft and chewy, but if you like yours crisp and crunchy then cook them a little longer because the longer they are baked, the crunchier they get. 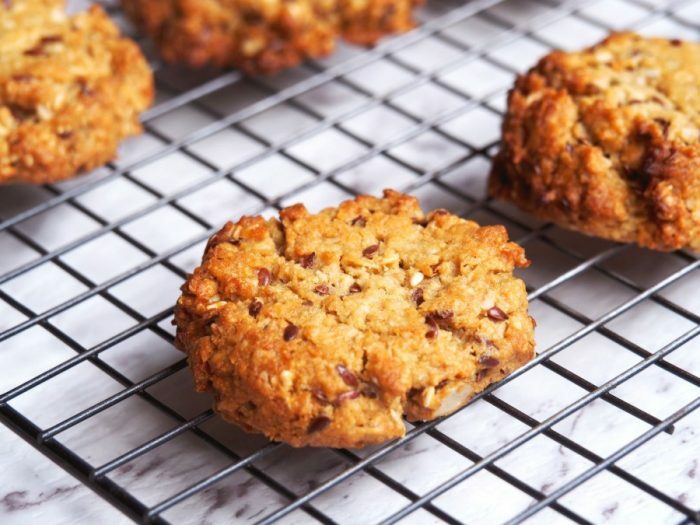 The cooked biscuits freeze fabulously for up to three months and freshly baked biscuits will keep for up to a week, although they do soften over time. Can you remember you eating your firstANZAC biscuit? Are you on Team Crunchy or Team Chewy? Combine oats, sifted flour, bicarb, coconut and seeds in large bowl. Combine butter, syrup and sugar and stir over low heat until melted and smooth. Remove from heat. Dissolve the bicarb in the hot water in a small cup. Add to the saucepan and stir. Stir the wet mixture into dry ingredients. Mix well. Roll heaped tablespoons of mixture into balls and place on lined baking trays. Press down with back of spoon. Allow room for spreading. Bake for about 8-10 minutes or until golden brown, rotating the trays half way through cooking. Allow the biscuits to cool on trays for 5 minutes before using a wide spatula to move them on to cooling racks. Store in an airtight container for up to a week. Preheat oven to180 C/160C fan-forced. Line 2 baking trays with baking paper. Roll heaped tablespoonfuls into balls and place on lined baking trays. Press down with back of spoon. Allow room for spreading. Bake for about 8-10 minutes or until golden brown, rotating the trays half way through cooking..